Are you a fan of the original Hollywood Squares? Read Lauri and Peter Marshall's story below. As the founder of Actors and Others for Animals in 1971, with my late husband Richard, I have been involved with animal rescue now for over 30 years. In May of 2004 I was introduced to Randi Berger through a mutual friend. 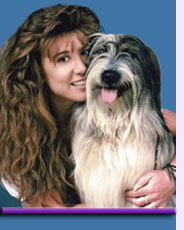 Shortly after, Randi brought into my life the dog of my dreams, now known as Daisy Basehart. I have known many rescuers in my time but Randi was the most professional and loving rescue person I have ever met. Randi's professionalism was really quite unique compared to any other rescuers. Many do not have much heart and are more interested in getting rid of the animal rather than focusing on the quality of people that they are giving them to as life companions. Randi stressed so much that this baby is going to be for life and she did it with so much love. There was no anger as there is with many other rescue people. I've seen so many rescuers and have never come across one as compassionate and kind as Randi. With love I am sending this. God Bless! 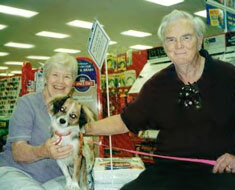 We have been referring our clients to Randi's Recycled Pets for over 20 years. 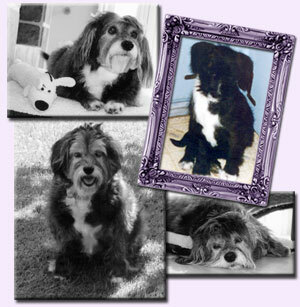 Generations of adorable dogs have found fantastic homes thru Randi's untiring efforts. My own special terrier, Ivan, was a Randi Rescue 15 years ago. Randi has dedicated her life to saving dog's lives, taking care of their medical, socialization and grooming needs, and then finding them the perfect home. Five years ago my beloved female Jack Russell, Gremmie died at the age of 16 1/2. A part of me died at that same time and I immediately knew that I needed to have another dog in my life. Preferably a female Jack Russell who looked exactly like Gremmie. In other words, I wanted my Gremmie back. Getting a list of all the Jack Russell rescues in the Southern California area I immediately set out on a pursuit to find her. After a week of searching I still hadn't found the dog I wanted...they simply weren't my Gremmie. The last place on my list was a Terrier rescue home with dogs that Randi Berger was trying to place. They had two female Jacks that needed homes. I rang the bell and what came to the door was a shaggy male terrier mix with a stuffed Santa Claus in his mouth. Not exactly what I was looking for. The female Jacks were not what I was looking for either. I left down hearted but found that I could not forget that shaggy mutt with the toy in his mouth. I went back three days later and adopted him. That was a little more than five years ago and that 23 pound bundle of joy is probably the best dog I have ever had. His name is Sammy Wonder dog and he is. When I enrolled my little puppy in an obedience class in July 1988, I had no reason to think it was going to be a life altering experience. But who can ever prepare for or anticipate the impact of meeting Randi Berger, the founder of Recycled Pets. A journey that began in the Pet Orphans parking lot, wound through animal shelters, and unkempt homes, always in search of the unwanted or mistreated dog, who deserved a better life. Randi Berger was the preeminent Pied Piper, leading the dogs and her odd assortment of volunteers, lawyers, little old ladies, actors and others, all seeking a purpose. 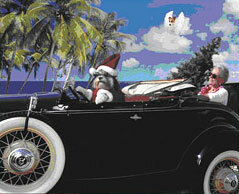 I found in Recycled Pets a worthy vehicle for my charitable spirit. For very little effort, and not a great deal of money, my life has been enriched. When you become a part of Recycled Pets, it's not just a stray dog that comes out a winner. 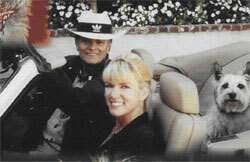 Peter and I met Randi in Encino while running her adoptions in the early nineties. She was the only one doing this at that time and was so bubbly and outgoing that we continued to visit her every week because of the fun atmosphere she creates... It's addictive! Her adoption dogs were always so well cared for and well groomed that it was difficult to believe she had rescued them all from public shelters. Randi's standards with the way she ran her adoptions were always exceptional and the care and patience she had in dealing with the people was impressive. We ended up helping with some of the fostering of her rescues and have stayed in her life throughout the years. She is a pioneer in the rescue world and an inspiration to all. 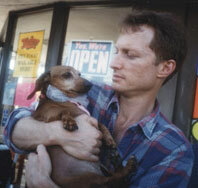 I have enclosed a picture of Charlie taken on January 31, 1996 [the color photo], the day we picked her up. I am sure you have handled many adoptions so I thought it would refresh your memory. The three other photographs were taken about a month ago. We can't begin to tell you how much she has filled our lives. She has taught us so much. When you think of how many animals are euthanized it just doesn't seem fair, especially since they give so much and only want to be loved in return. Charlie will be 13 years old at the end of the year. She is in good health and we walk her in the park every day. We never leave her. She travels with us and seems to enjoy it. Again, Randi, Jim and I would like to thank you. Had it not been for th ead you placed in the newspaper, we would not have had this wonderful little creature in our lives. We are from England and first met Randi whilst living in LA in the spring of 1991 when we fostered two of her dogs, but we had known of her prior to that. In the autumn of the previous year we had seen in our local paper an intriguing photograph of a very pretty woman sitting down to eat surrounded by dogs sitting on chairs around the table, all prepared to enjoy their Thanksgiving dinner! We were so fascinated with this that we actually sent a copy of the photograph back to our family in England. During that spring we were missing our dog Mutton who was back in England, so that’s how we came into the fostering game and met Randi for the first time. It was to foster one of the many dogs she had rescued from the shelter. This was a little blonde terrier mix called Sammy who was about ten months old. He shivered in the car all the way home and when we got there he ran under the table and stayed put for three days. We had to crawl under to give him food and lift him out to take him outside, but within a week he blossomed, began to wag his tail, and when we took him to Malibu Beach he ran like the wind with sheer happiness! After six weeks Sammy found a permanent loving home. The second dog (another blonde) we fostered looked so like Sammy we thought they were related, and named her Sadie. She had different problems. She was agoraphobic and terrified of the outdoors. In contrast to Sammy, when we took her to the beach she was terrified and tried to dig a hole in the sand to hide herself. Both these dogs, renamed Buttons and Muffin, had a long and happy life with a loving new owner, and none of this would have been possible without Randi’s perseverance, compassion and sheer love of dogs. These are just two examples... Randi has rescued thousands. We had to go back to England, but in the time that we have known Randi she has never stopped rescuing dogs, going into the most awful shelters and picking out the no-hopers, patching them up and getting them adopted. We are proud to know Randi—proud to be her friends—and proud of her work. Randi Berger of Recycled Pets Rescue is one of the truest, most genuine individuals I have ever met. 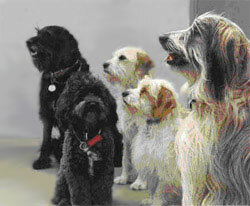 When I had to find a new home for my Lhasa Apsa, I contacted Randi. I knew from the time I placed Bitsie under Randi's care that I had no cause for worry. She found a beautiful home for Bitsie in less than a week. Randi is honest, non-judgmental and always speaks her truth from her heart. She has a special, inborn talent for saving and "recycling" pets. Every dog she has ever rescued or placed still has a special place in her heart. Because of my experience with Randi, I have become a lifetime supporter of her mission to rescue pets. I admire and respect her very much, and she has become one of my dearest friends. 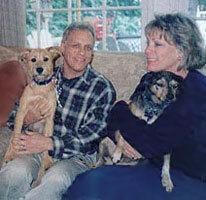 I found my experience adopting my two dogs, Godfrey and Gilly, through Randi Berger in 1996 to be wonderful. They were both 6 months old and made great companions. Randi made the process of our first time adoption very comfortable and informative. She was very supportive throughout the entire process and has been there for us over the years answering any questions and always available to help with any issues. I would recommend Randi as an expert on all dog related issues and adoptions. Since I met Randi Berger in 1994, my life has never been the same. She has a lot to do with helping my life be what it is today. Randi caught me in my negative thoughts of lack and immediately had me doing positive affirmations. I began fostering dogs for her and then was helping run her adoptions. After learning how to run an entire rescue from working with Randi, in 1997 I found the courage to go off on my own and started Pacific Coast Dog Rescue. Today I have a thriving rescue and dog training business that I credit much to Randi's affirmations, experience and chutzpah. For the past several years, it has been my pleasure to help Recycled Pets Rescue with some of it's prescription medications. Older animals (both canine & human) have health needs that must be addressed to insure a robust quality of life; Randi Berger's care and concern for her charges, is heart warming to behold. True advocates are a rarity, and Recycled Pets Rescue exemplifies all that is good about pet adoption. I have had the pleasure of knowing Randi Berger and the amazing work she does with her Recycled Pets Rescue Organization for over 15 years. I have stood by her at some of her adoption events and have seen how careful she is when it comes to finding permanent, "forever" homes for the dogs she rescues from various area animal shelters. As the publisher of The Pet Press, a free, monthly newspaper reaching more than 100,000 readers in the Los Angeles area, I work with close to 75 rescue organizations. Occasionally readers send me letters complaining about one group or another, but never in 15 years have I ever heard one complaint about Recycled Pets. From my observation, there is no one who cares for her rescued animals with as much love and compassion as Randi Berger. Her rescued animals are always immaculately groomed and well-cared for by local area veterinarians. This is the same treatment she expects new owners to give any dogs adopted from her. Randi and Recycled Pets Rescue are the example that any rescuers would want to follow. After buying cute little puppies for years, in 1981 I rescued an Akita mix. That was my begining. Many great rescued dogs later, I heard about Recycled Pets and the good work you had been doing. 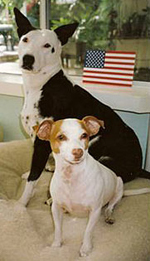 Of the many dogs I have rescued, Petey, now Ziggy, was by far the easiest dog to assimilate into our daily lives. You and your helpers had him ready for prime time. Housebroken, no chewing and a great protector, and he gets along great with my other dog and our cat. What separates you from the many adoption services is how you match the dog with the family most likely to succeed in bonding with the dog. Keep up the great work. I have networked with Randi Berger, of Recycled Pets Rescue, for nearly 10 years. This networking has included notifying her of possible dogs for rescue in the San Fernando Valley, meeting her at shelters to identify and take out dogs in danger, helping screen potential adopters and sharing information for other-breed rescues. Randi has consistently been helpful and courteous in her rescue tasks, which is what is critical in giving any rescue longevity. I have received calls from several people related to her rescue, including both potential and actual adopters. I have heard nothing but compliments from everyone regarding Randi's dedication and ability. On behalf of my own rescue group, Southland Collie Rescue, I consider Randi an excellent fellow rescuer and hope to continue working with her in the future. Stephen Colley, President • Southland Collie Rescue, Inc. Husband John and I had been either dog-free or dog-deprived for about two years since the demise of our sweet little Lhasa-terri-poo, Sam, and we had come to the conclusion that the right term to describe us was dog-deprived. My search for another poodley mix ended abruptly one evening when my Internet search wandered into an entirely new category, Papillion. We were both delighted with the sweet, sassy face of a little pap-spaniel mix, and following an extended telephone interview, we were able to rendezvous with Randi and Lily at the Encino Petco Store. Randi was careful to ascertain that this spirited pup would be a good match for too gray-haired prospective adopters, but there was no hesitation in our innocent hearts. Two and a half years later, I can only say that adopting Lily was one of the best decisions John and I have made. Beach walks, auto trips, hikes and rainy days at home are all more fun with Lily. She is a dutiful watchdog and a joyous welcomer to friends. Lily also brings much happiness to many of our friends who are unable, (or a bit too sensible), to own a dog, but love to share her enthusiasm and joy on walks or in our home. In my application to Recycled Pets, I stated that "Life is a little sweeter with a dog in the home." I believe it more than ever today. Thank you, Recycled Pets Rescue. My name is Kiki. I am a little Lhasa Apso. Lorraine and David, who rescued me, had hoped to look after me but sadly this was not meant to be—Apartment Policy. Lorraine and David were due to leave on vacation and I was beginning to be rather concerned, but I relaxed when I was introduced to Randi Berger of Recycled Pets Rescue. Right away I sensed she was a kind person with an inborn love of animals. Her enthusiastic, bubbling personality was reassuring. She worked hard and very soon I was introduced to a prospective guardian—Fran from Beverly Hills. I was so happy! Fran was so nice and she liked me too!!! I now have a wonderful new life. I have told all of my friends how very helpful and understanding Randi is, and if they ever have a housing problem... Call Randi.